(Nanowerk News) Research at MIT has uncovered new information about how nanoscale patterns on the surface of a material can produce significant changes in the way it interacts with liquids. The discovery could be significant in understanding interactions that affect a wide variety of biological processes in living cells, as well as many manufacturing or energy storage systems. Specifically, the researchers, led by associate professor Francesco Stellacci, were studying a property of surfaces that is technically known as interfacial energy, or, more generally, as wetting. This describes the propensity of liquids to spread evenly over a surface, as opposed to beading up. They found that if the surface bears a particular kind of patterning the wetting capability can increase, or decrease, by at least 20 percent. The findings were described in a paper published in the Sept. 13 issue of the journal Nature Materials ("The effect of nanometre-scale structure on interfacial energy"). "Especially in biology, these interactions can be quite complex," Stellacci says, and understanding them better could be a significant step towards being able to control some surface processes more effectively. While most research has looked at wetting properties of surfaces based on their overall, averaged chemical composition, he says, "what we found is that the way water or a solvent wets the surface also depends on the structure of the surface." This is a fundamentally new discovery, he says. Differences in wetting characteristics of surfaces are common: for example, the way raindrops tend to bead up on a car's windshield is an example of poor wetting, while a drop of oil on glass tends to spread out quickly — an example of strong wetting. Special coatings on aircraft windshields are used to improve the wetting, causing rain to spread out uniformly and improving visibility. The team found that when it coated a gold surface with patterns of alternating hydrophilic (water-attracting) and hydrophobic (water-repelling) compounds, the behavior of that surface depended critically on the scale of the patterns. When the patterns were smaller than about 2 nanometers in size, comparable to the size of the hydrophobic or philic domains on a biological molecule, the patterns produced significant changes in the wetting properties of the surface, but when the patterns were larger than that the material behaved just as would be expected from the average chemical characteristics of the whole surface. The finding could affect many kinds of processes, the researchers say, from how a drug penetrates a cell membrane to how coatings adhere to surfaces, such as the catalysts coated onto electrodes in a fuel cell. "For any fluid you think of, any process that happens in a wet environment, at the interface between a solid and liquid, this will be important, especially in systems where the solid surface is complex at the molecular level," says Kislon Voitchovsky, a postdoctoral researcher in the Department of Materials Science and Engineering and a co-author of the paper. The patterns required to produce this effect form naturally on slightly curved surfaces, the team found. Rather than requiring a printing or etching process, the patterns spontaneously assemble themselves when certain mixtures of chemicals are placed on the surface. David Chandler (no relation to this reporter), a professor of chemistry at the University of California, Berkeley who is an expert in the field but was not involved in this work, comments that this research "seems to be good work exploiting recently understood principles of the hydrophobic effect." Chandler adds that hydrophobic surfaces at the nanometer scale can produce "soft fluid interfaces" whose properties can fluctuate significantly. "These fluctuations can propel and stabilize nano-scale self-assembly," he says, referring to the way some molecules naturally line themselves up in specific patterns without requiring any outside control. "This [self-assembling] effect is ubiquitous in biophysical systems. I believe that Stellacci's work is among the first to exploit this effect in the domain of materials science." At this point, Stellacci and his team have measured a 20 percent increase in the surface wetting with the patterned surface, but he thinks the change could be much greater than that once they try different wetting chemicals in the system, and could also be varied to produce a decrease instead. The difference could be enough to make certain reactions go in different directions or change the efficiency of certain enzymes depending on the patterns that are present, says graduate student Jeffrey Kuna, the lead author of the paper. For example, in proteins inside a cell, the presence or absence of such surface patterns could determine how a protein interacts with a particular enzyme, or with the membrane of a cell — key steps in many biological processes, for example in the immune system's detection of pathogens. 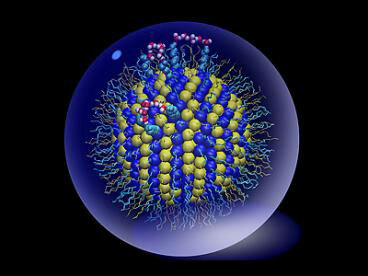 Or it might produce a faster catalytic reaction on the electrodes of a fuel cell or other device. Now that they have demonstrated the basic process, Stellacci says, the next step is to look for examples of the process in action in real biological systems, such as proteins in a cell. Then, they will try to determine if these processes can be altered. "Can we apply this to create surfaces to wet better, or worse?" he asks.